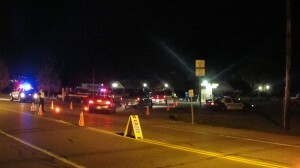 OSWEGO, NY – The Oswego County STOP-DWI Program announced that law enforcement agencies across Oswego County will participate in the STOP-DWI Enforcement Crackdown to help ensure that our roadways will be safe during the Halloween holiday. The STOP-DWI Enforcement Crackdown is comprised of several crackdown periods promoted by the New York State STOP-DWI Association. These efforts are supported with funding from both the Governor’s Traffic Safety Committee and the National Highway Traffic Safety Institute. STOP-DWI Enforcement Crackdown Checkpoint set up in Fulton during the 2012 Halloween period. “We encourage people to have a plan before they start Halloween activities. Have a plan to and from their destination using a designated driver, taxi, or by walking if they plan on consuming alcohol,” Lighthall added. For more information about Oswego County STOP-DWI please follow the program on Facebook.